CLASSIC Sewing Summer 2016 new summer sewing techniques and stitches. 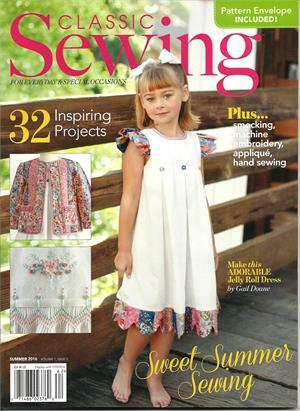 This second issue of Classic Sewing has a plethora of projects, ideas and new products you will enjoy. The cover dress and jacket is by Gail Doane using jelly-roll fabrics, but can easily be created with your favorite fabrics not just jelly-rolls. Also included in Issue 2 is smocking, machine embroidery, applique and hand-sewing. 32 inspiring projects! Which one will you want to start first? !